Advertise On Monadnock Dining - The Monadnock Region's Most Comprehensive Restaurant & Dining directory. Anyone who lives and works in the Monadnock Region knows that there are many, many choices for their dining dollars. And, with the state of today's economy many diners are being more cautious (and frugal) when making that choice! Yet they still want to dine out. 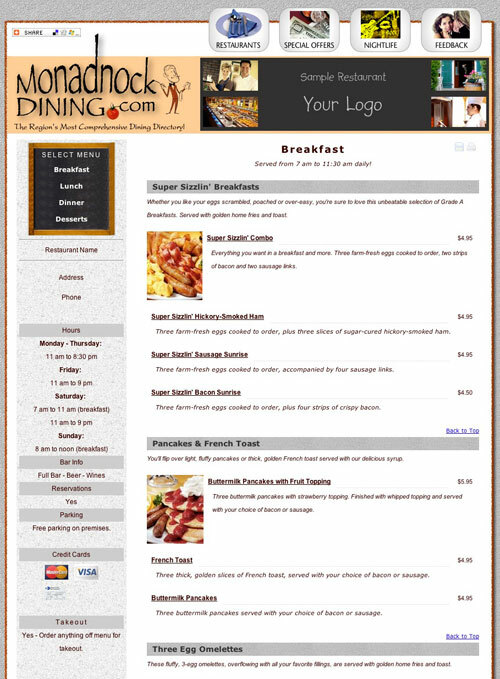 MonadnockDining.com offers the perfect resource for diners. We help them to find, and encourage them to try, new restaurants. We also help them to learn more about their favorite ones. Diners are able to search for restaurants by cuisine and are even able to preview the restaurant's menu. This allows them to try new restaurants with confidence. 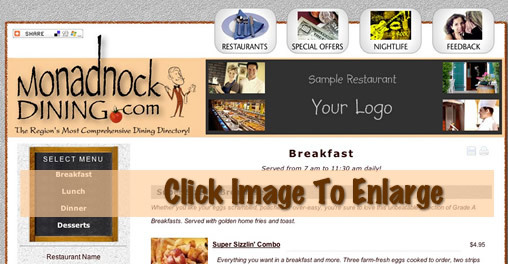 Even if you already have a web site, MonadnockDining.com will bring you more business. Our site is located at the top of the major search engines, so diners will find your restaurant quickly. You also have added credibility by being recommended on a third-party web site. We'll drive customers to your site, AND to your door! Adding your restaurant to MonadnockDining.com is simple! First, decide on the cuisines you want to be listed under, and provide us with a brief description of your restaurant and a photo. If you want us to include your menu, we'll need a copy, either printed or electronic. We'll create an attractive listing that explains what makes your restaurant unique. You can even have an entire section of the site devoted to YOUR restaurant - it's like having a web site of your own (including your full menu), without worrying about the maintenance! We offer three different listing types to choose from. Select the type that best fits your needs and budget. ALL of our listings are 100% satisfaction guaranteed. If you should decide that your listing is not right for you, we'll refund your entire payment during the first 30-days, and then a prorated amount after that! "MENU PLUS" Listing - Better than having your own web site! MENU PLUS: Your "MENU PLUS" Listing includes all information from the PHOTO Listing above, plus a link to a special section on the site that contains your menu, photos, hours and more information about you. It's really a complete web site within the Monadnock Dining web site! MENU PLUS Listings allow up to four cuisine categories. Note: Only restaurants within the Monadnock Region are listed. Cost: Starting at just $20 per month. "PHOTO" Listing - Stand out from the crowd! PHOTO LISTING: A "Photo" Listing allows you to tell more about your restaurant, and also includes a photo. Each restaurant is listed by geographic area AND cuisine, Enhanced Listings allow you up to two cuisine categories. Note: Only restaurants within the Monadnock Region are listed. Cost: Just $7.50 per month. "BASIC" Listing - You can't do better than free! BASIC LISTING: We offer all restaurants within the Monadnock Region a FREE listing for their restaurant. This includes your name, address & phone under one cuisine category of your choice. If you'd like to stand out, please consider a PHOTO or MENU PLUS listing. 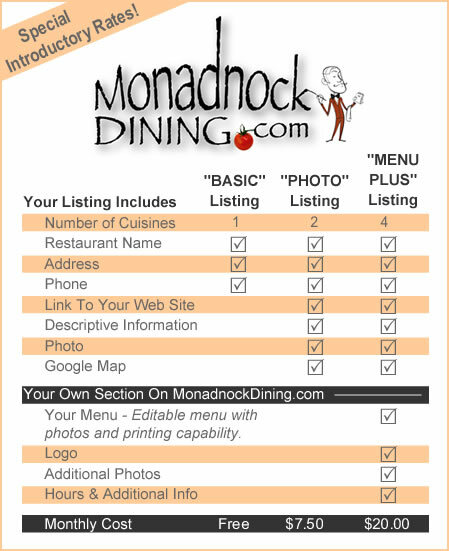 Including information about your restaurant on the MonadnockDining.com helps you reach diners from inside the region and OUTSIDE. Numerous studies have shown that travelers prefer to determine their basic itinerary before they even leave their home. 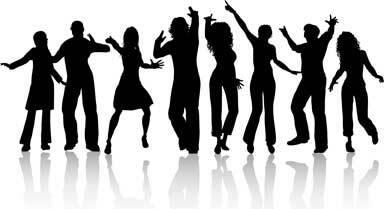 MonadnockDining.com is designed to allow these potential customers to find you. Your listing also appears on SouthwestNH.com (a major tourism site), which provides a wealth of information about the Monadnock Region AND the many fine shopping facilities, eateries and lodging establishments they will find here. Please support the local flavor of our community . . . dine at your independently owned restaurant!